Today we are finally ready to reveal to you the wonderful spa bath remodeling project that we have been working on for the last several months. It took a lot of planning and work from everyone involved, but the results have proven it was well worth the effort! Let’s recap what we started with and the challenges that we faced. Our client had purchased their home after a long search. 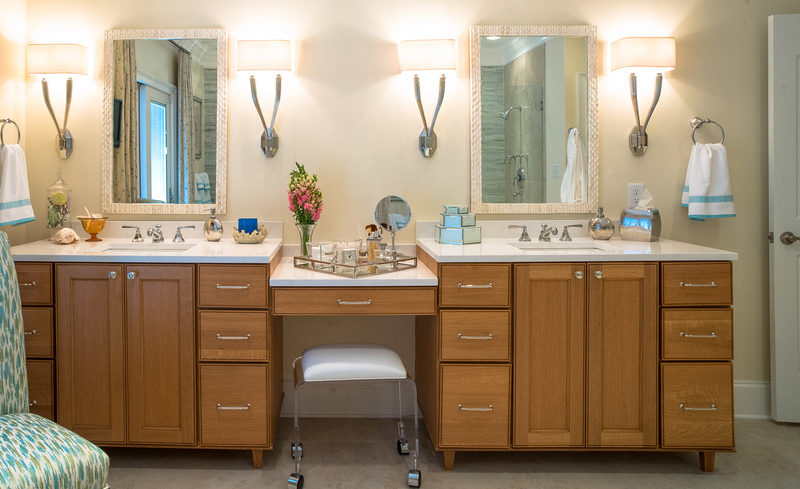 Although the home had many of the features and amenities that she wanted, the master bath was a real drawback and certainly not what she envisioned. 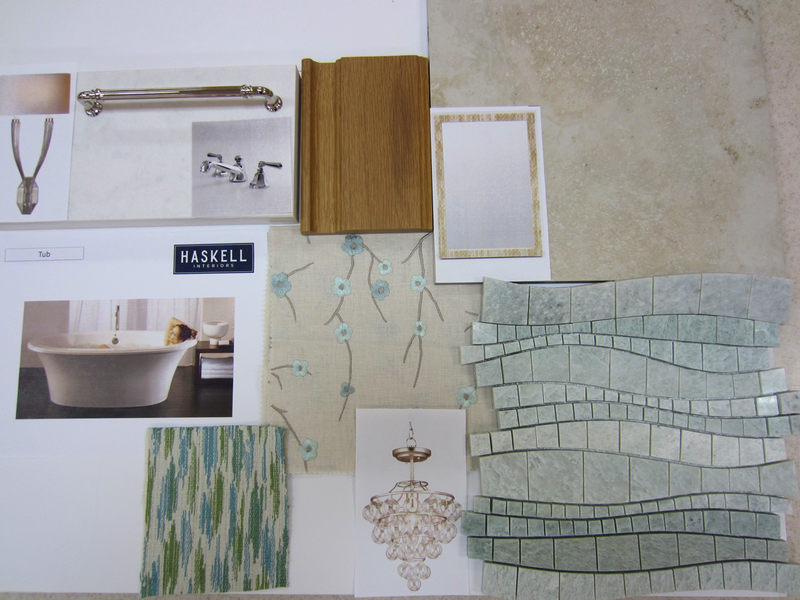 She wanted a spa retreat with a large shower and soaking tub, plus plenty of storage and great lighting. Above all, she hoped for a peaceful place to unwind at the end of a long work day. What she got (and what we started with) was a large but misappropriated space that was dark and dreary. An awkward shower configuration, no tub, and cabinetry that were far from practical or functional were the main issues that greeted us the first time we walked into the room. Although there are many circumstances when we can keep old elements in a room for a bath remodel, this project was definitely a total bath remodel. That said, we did keep a few little things: the crown molding was very nice, and the sliding French doors afforded us great views of the woods and the trees beyond. Finally, we would not need to redo the basic layout of the room–the space was large and already had a separate water closet and clothes closet to work with. So our challenge was to take this room and transform it into a relaxing retreat that reflected the beautiful surrounding woods while giving our client all the features and amenities that would make her feel like she was in a luxury resort. Our first step was to come up with a new floor plan. Although the room was large, there was a lot of wasted space and inadequate storage. 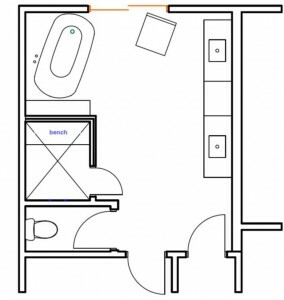 Our new layout keeps the water closet in the same place, but also adds a large soaking tub where the old shower used to be. This allows for long soaks while looking out to the sky and the woods beyond. 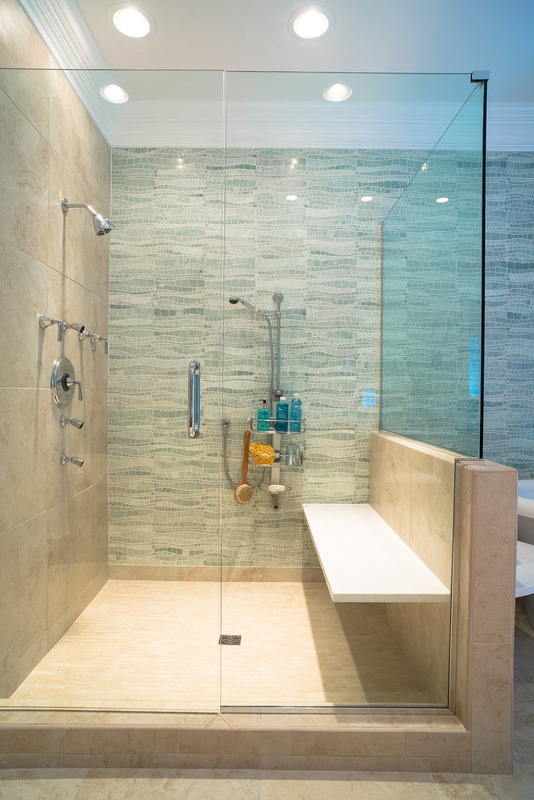 Next, the shower was designed with a bench for relaxing, while also providing a ledge that extends out to the tub–the perfect area to place your phone, glass of wine, lotions, and anything else you need for a spa bath experience. The next step was to tackle the vanity area. 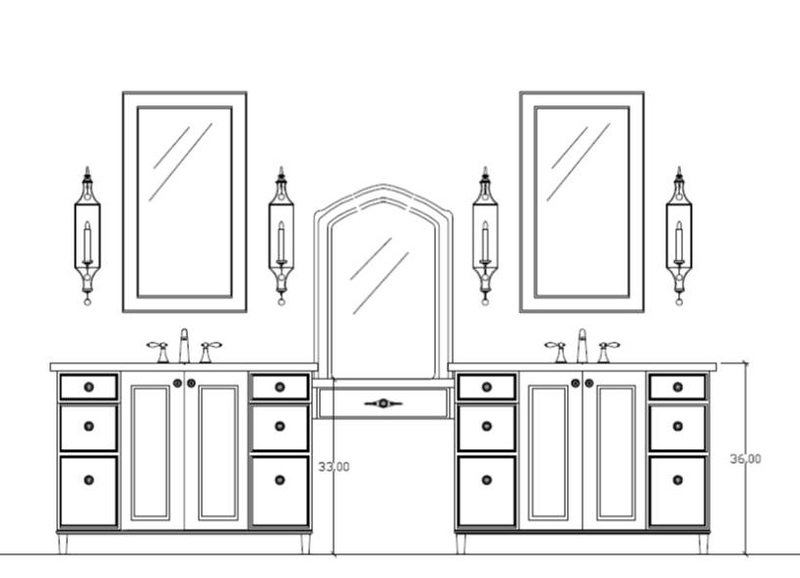 Our new design not only makes the vanity more attractive and practical with lots of storage, but also provides the sitting area our client requested for easy makeup application. We also made room for a comfortable dressing chair. Finally, in the master closet, we designed a layout that provides an island for storage, lots of hanging, drawers, and shelves for clothes and shoes with plenty of room for expansion. As for the materials and finishes, the main focus was on soothing colors and materials and textures that reminded us of the natural woodland surroundings of the home itself. A sky and water motif inspired our selections to bring gentle calm to the space, with use of organic materials that would feel refined, but not overdone. Our client requested a quiet retreat to begin and end her day and the right choice of materials was critical in achieving this. So now to the reveal! What used to be a drab and unexciting bath room, is now a stunning master bath retreat worthy of a five star hotel. A new, more functional layout, beautiful materials, and an abundance of practical storage makes this bath one that our client never wants to leave! The focal point of the whole room is the wall of green marble, in a wave pattern, reflecting the mountains that surround the home but also the waves of the ocean. 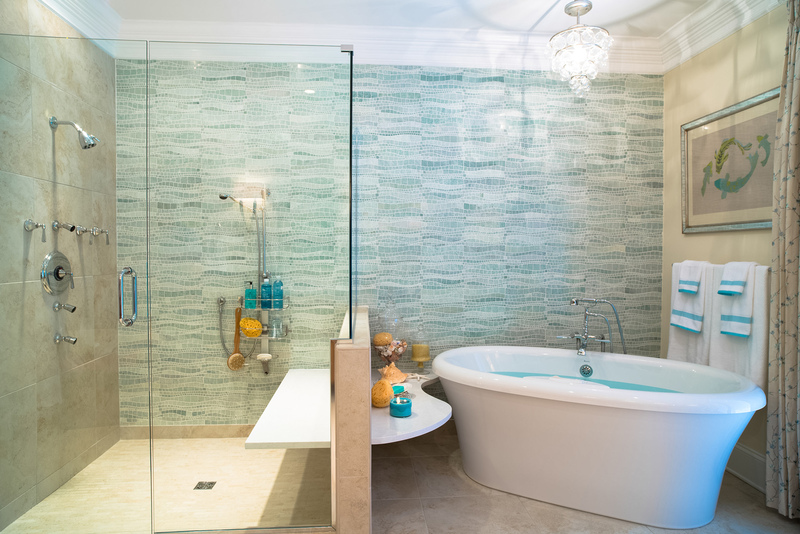 By running the tile along the entire length of the room, we created not only a wonderful tile wall in the shower, but a stunning backdrop for the therapeutic air tub we installed. The shower is fitted with both a shower head and separate handheld shower, while body sprays help massage away the tensions of the day. A natural quartz ledge that serves as a bench in the shower continues through the wall and becomes a curved ledge to serve the air tub. A bubbling chandelier overhead provides light while adding a fun touch, and again, echoes the themes of water and sky. The porcelain tile is the color of beach sand, mindful of walks along the shore or the river’s edge. On the opposite side of the master bath is the vanity in an elegant limed oak finish–beautiful yet simple, and offering an inviting texture to contrast with all the smooth surrounding surfaces. The same natural quartz that we used in the shower is repeated here in a simple and very practical counter surface. The sconces with their paper shades, the faucets, and the cabinetry hardware in polished nickel give a little sparkle to this otherwise calm retreat. We also selected mirrors in a simulated bone that add both texture and an organic feel to the space. Our fabric choices for the drapery panels and the chair echo the movement and colors found in nature, all while providing comfort and softness to the master bath spa retreat. 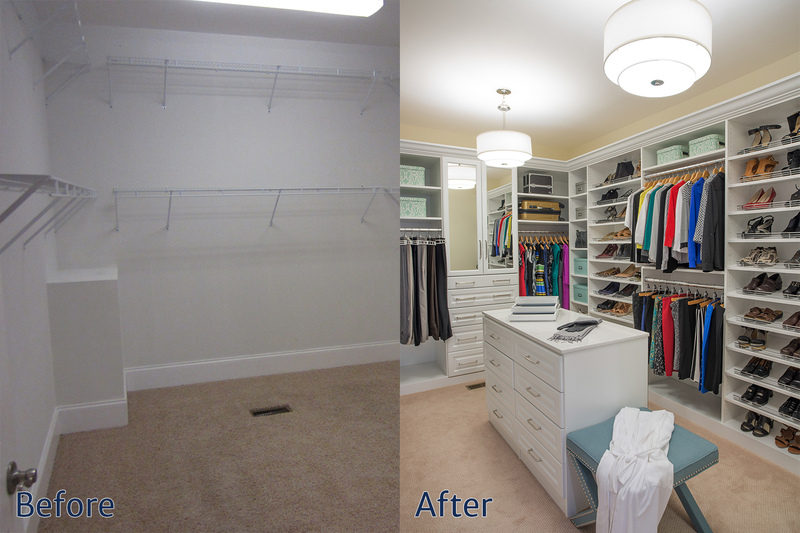 Finally, in the master closet, we transformed a basic space with wire shelves and rods into something much more functional and inviting. Dramatic lighting, an island, mirrored doors, and plenty of hanging and drawer space make this closet not only great for finding everything at a glance, but also for creating a stylish addition to match our transitional new bath. In the end, our client was thrilled with the results. She says she loves spending time in her new bath, relaxing in the tub as well as the shower. 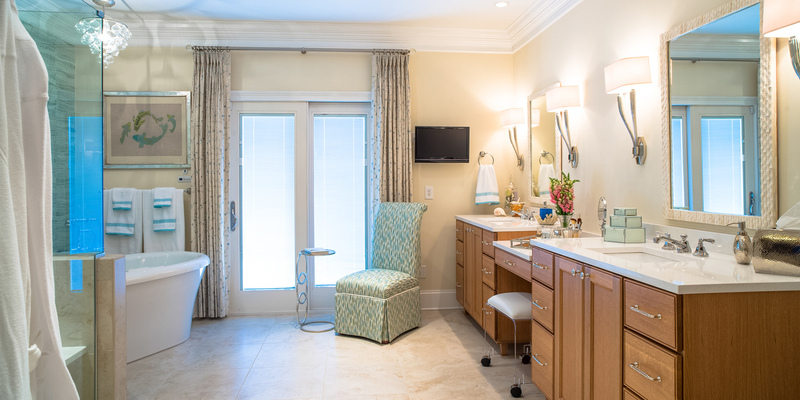 What started out as an uninspired, dreary space with poor function is now a calming, nature-inspired spa bath retreat that gives our client the practical and elegant space she had always envisioned.